With a technical background in materials science and mechanical engineering, and a natural focus towards product and user experience design, I’m often not able to bring all my worlds together in one focus area. That’s why I love talking about trends in wearable sensor development, because those products perfectly combine UX and sensor development. 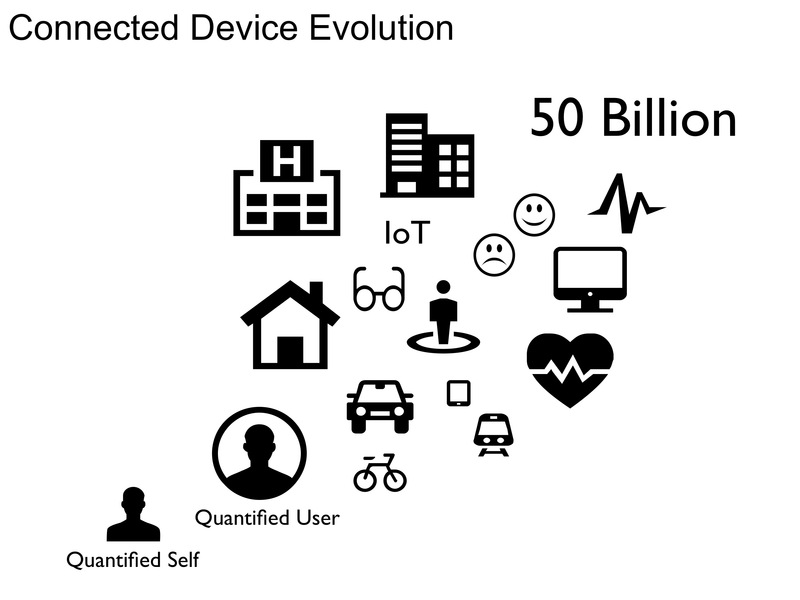 During the 2014 Swiss Startup Camp I organised a session on UX and wearable tech, with a focus on thinking about how new sensor technologies can be leveraged for new product use cases and business opportunities. It’s usually not talked about, but many of the trends in Human Computer Interface (HCI) devices are closely tied to the materials used in their development. 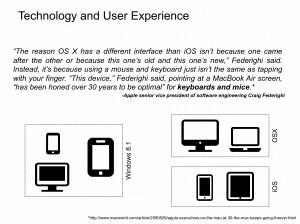 And then, once a consumer knows what a keyboard is, for example, then their conception of new products will be biased towards that vision in their head. This can create a barrier for new product development from consumer acceptance and the marketing risk viewpoint. Look at the laptop, for example. 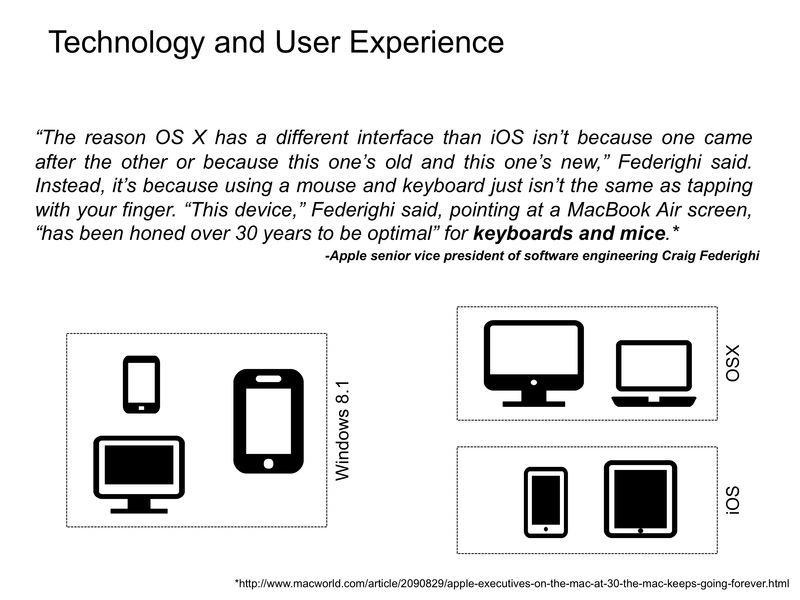 The strategy of Apple is to keep their OSX and iOS user experiences separate. One is touch, the other is keyboard + mouse. Even though the technology exists for Apple to make a touch-screen MacBook Pro (which I would love), they probably won’t do it because everyone knows what a MacBook is supposed to be: glossy screen, aluminium body, etc. They don’t want to start mixing the UX and consuming consumers because they already have a lot of happy customers buying both devices. On the other hand, Microsoft is happy to build both touch and keyboard UX into the Windows 8 OS. I actually love this idea, mainly because two weeks after using the iPad, I found myself instinctively trying to interact with my laptop by … tapping on the screen. So, now that wearable tech products like FitBit, Nike Fuel, and an exploding catalogue of smart watches are coming onto the market, consumers are going to start associating that form-factor to what a wearable tech device should be. However, all of those products are based on sensors built up from the Integrated Circuit (IC) industry, meaning they’re hard sensor elements measuring values like acceleration, temperature, orientation, etc. all basically using the same technologies. However, other options exist. The area of soft or flexible sensor technology based on conductive particle composites (CPC) or conductive nano-coatings will give us the ability to weave conductive fibers into our clothing and create soft-touch interface elements on products which we normally don’t associate with computer interfaces. This means we can use Natural User Interface (NUI) patterns that consumers are used to from their smart phones, and build those user patterns into our clothing for controlling our smart walls and the increasingly connected world around us. The future is an exciting place, but it’s even better when we build it with an open mind towards new use cases for products and find unique solutions for people instead of just layering technology onto them.